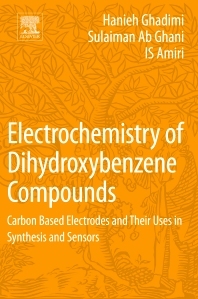 Electrochemistry of Dihydroxybenzene Compounds: Electrochemistry of Dihydroxybenzene Compounds focuses on developing a simple, highly sensitive and accurate voltammetric method to assess diphenols and other chemical compounds using composite-modified and glassy carbon-based electrodes. The determination of the trace levels of chemicals in products is a fundamental challenge in chemistry research, education and industry. This book presents significant approaches to this challenge, including the application of a wide range of electrodes under easily controlled conditions. Practical and concise, the book is an accessible quick reference for chemists and pharmacologists for assessing the electrochemistry of D-compounds. Hanieh Ghadimi, received her Ph.D. in analytical chemistry-nanoelectrochemistry in 2013 from the Universiti Sains Malaysia (USM) in Penang, Malaysia. She started working as a post-doctoral research fellow at the University of Malaya since 2014. Her research interests include nanomaterials, composites, chemical sensor and electrochemical sensors. She is also a part of the Department of Chemical and Biomolecular Engineering at the University of Akron, OH, USA. Prof. Dr. Sulamain Ab Ghani received his B.Sc. at UKM (1974), his M.Sc. at Salford (1978), and his Ph.D. at Salford (1983). His research interests include chemically modified electrodes for application in sensors, fuel cells, nanotechs and new analyses. Dr. IS Amiri, received his B. Sc (Hons, Applied Physics) from Public University of Oroumiyeh, Iran in 2001 and a gold medalist M. Sc. from Universiti Teknologi Malaysia (UTM), in 2009. He was awarded a PhD degree in nanophotonics in 2014. He has published journal articles and books across a broad range of topics including Optical soliton communications, Nano photonics, Nonlinear optics, Fiber optics, Quantum cryptography, Computer communication, Nanotechnology, Information security and Biotechnology engineering.